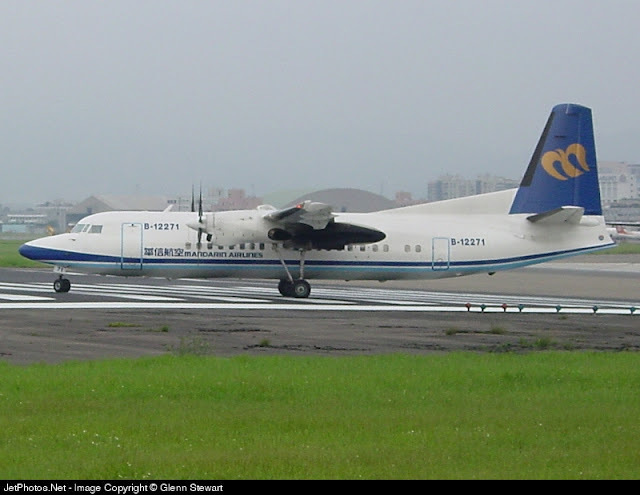 Welcome to my Trip Report on Mandarin Airlines flight from Magong to Taipei Songshan Airport! For my previous flight experience with this airline, click here. I booked this airline before Uni Air's air ticket from Songshan to Magong as this airline was selling this sector for a very cheap one-way fare of US$35. Furthermore it was flying the ERJ-190 on domestic routes and regional routes and there isn't any chance of this being upsized to the Boeing 737-800, so I went for it without hesitation. 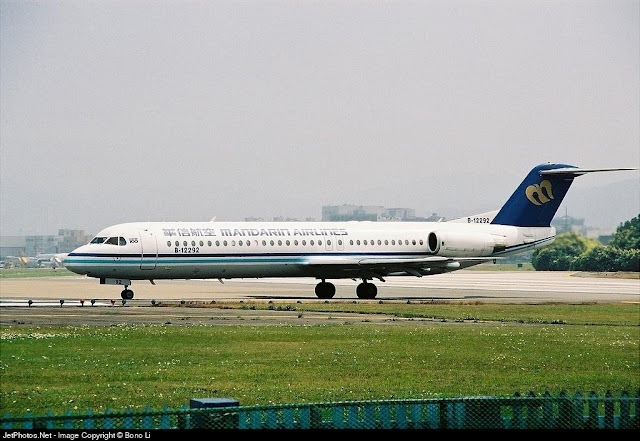 I could have done Uni Air both way including this sector, but the airfare on this sector was about 50% more expensive than this airline's so that wasn't much to think about right? Besides I am a fan of the ERJ-190, I won't mind flying on it once again. 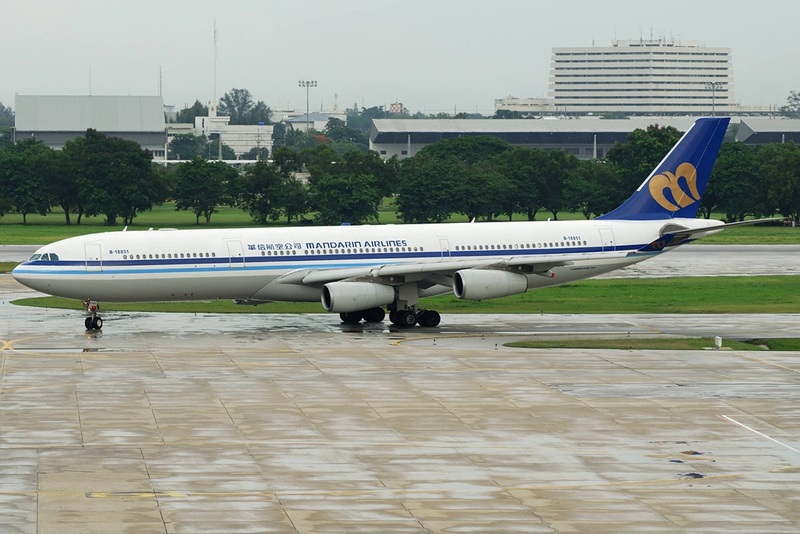 Mandarin Airlines is a subsidiary of China Airlines, set up by the parent airline and CTBC Holding on June 1991 to operate flights on behalf due to political pressure. The People's Republic of China wanted to boycott the presence of China Airlines due to the Republic of China's flag on the aircraft but didn't object other Taiwanese carriers not having the flag on the airlines' livery. 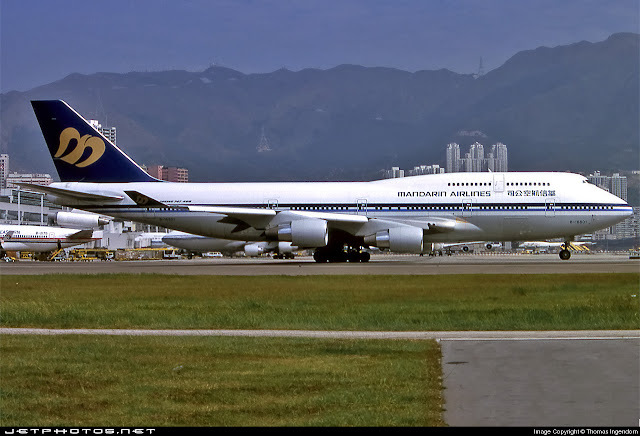 Therefore this airline was set up and operate some long haul flights such as Taipei to Sydney and Taipei to Vancouver using long haul aircraft such as MD-11 and Boeing 747SP. 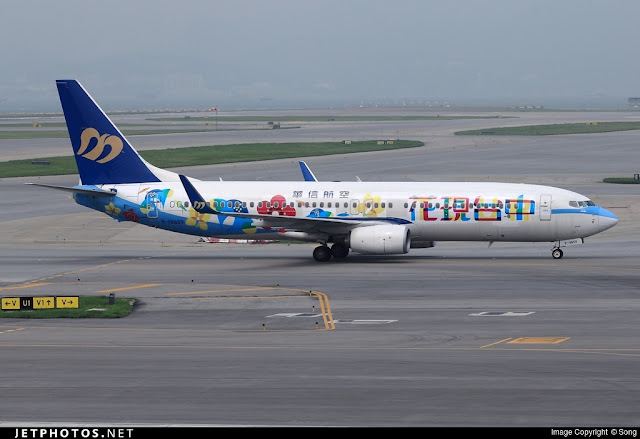 By 2007, this airline is owned by China Airlines (93%) and currently operates only narrow-bodies: Boeing 737-800 and ERJ-190s. 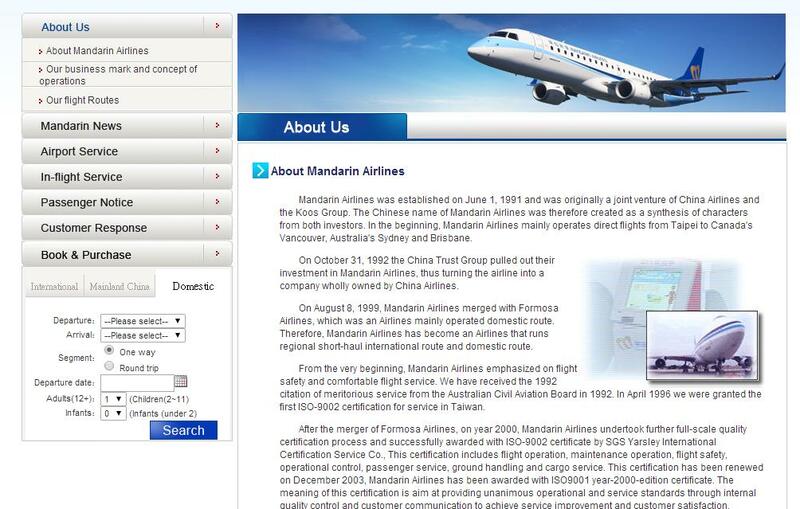 In 1999, Mandarin Airlines merged with Formosa Airlines (A domestic Taiwanese airline) using Mandarin Airlines name and it took over Formosa's domestic operations and the long haul aircraft were transferred to China Airlines. This airline has English version so non-Chinese travellers shouldn't have any issues making their booking. The website can be updated though. 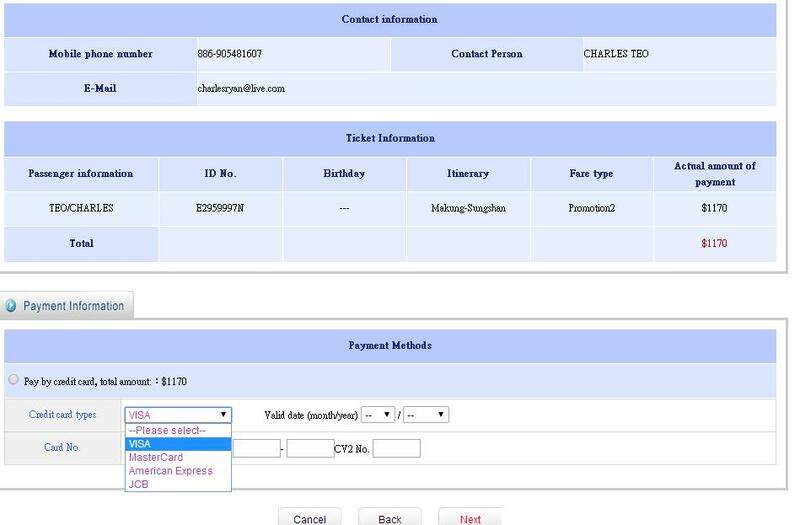 See the difference between the promotional and full fare? No issues with the system. Made my booking shortly after seeing the air fare. 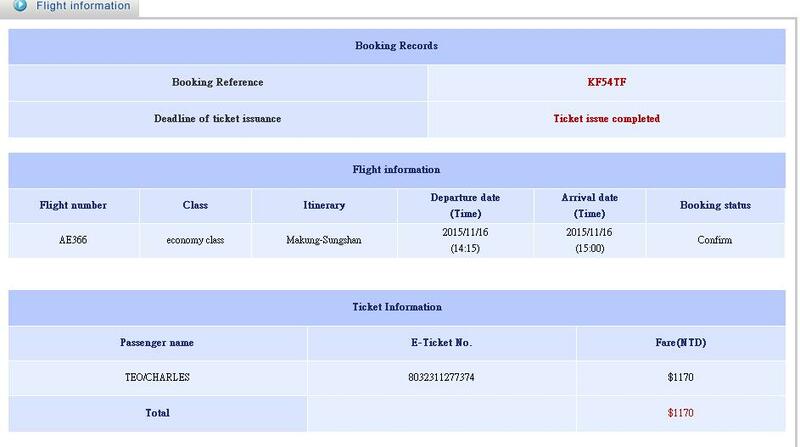 Confirmation of my flight after booking was completed. After arriving from Taipei Songshan with Uni Air, I had about 5 hours to spare. Instead of heading out to town, I decided to stay put at the airport and do some work, thanks to the free airport Wifi. Thanks for the ride, B-17001! This was my first time walking from the aircraft to the arrival hall at Magong Airport. Magong Airport was originally opened in 1957 for military personnel and cargo transportation and the terminal was constructed in 1966. 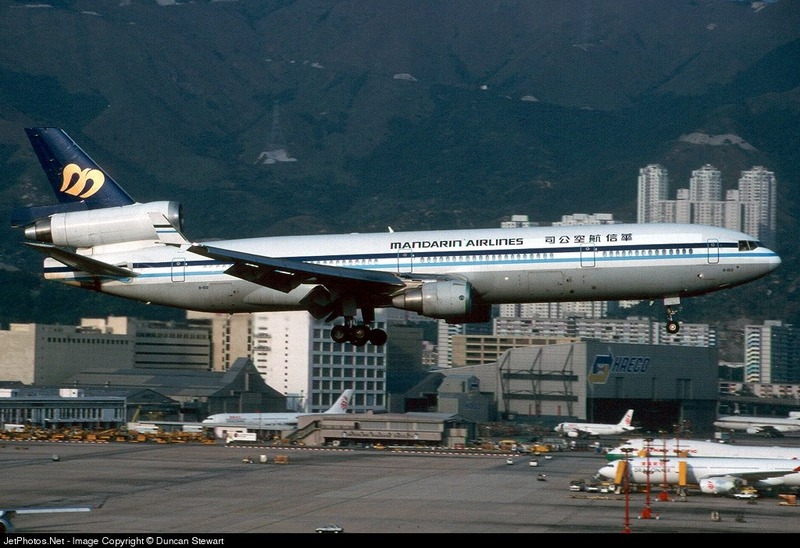 Airline operation at the airport began only in 1977. In 2004, the second phrase of the airport terminal was completed and this includes the waiting room and terminal building. 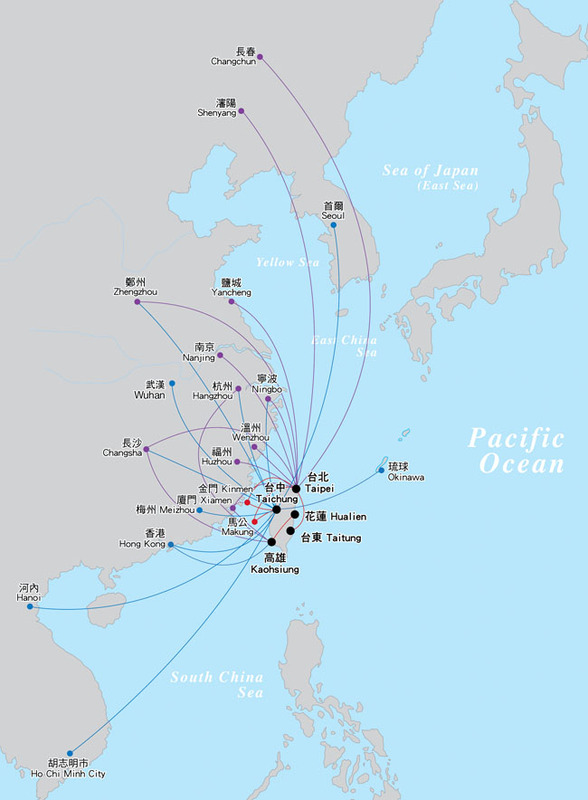 Only domestic flights operate to this airport. Here are some photos of the interior of Magong Airport! This airport serves only domestic flights. This was where I checked in for my return flight. Need directions? You can come here for help. Parking lots for motorcycles - a common transport for the locals. Much cheaper than owning a car. Thank you Uni Air for the ride here! 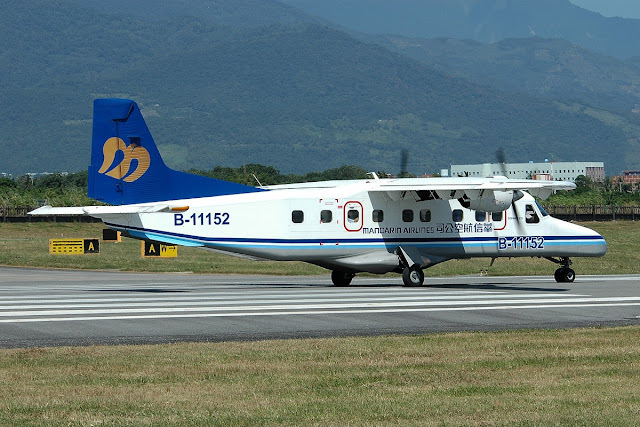 Thanks to flightradar24, I got to know which aircraft was fetching me back to Taipei, B-16826, the first time for me. My previous flights with Mandarin Airlines, I flew on B-16821 and B-16829. 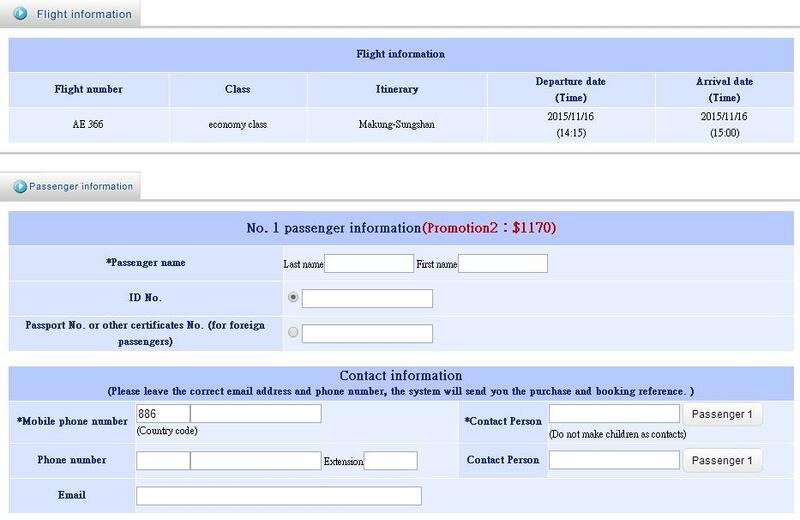 Meanwhile, B-17001 was on the way to Chiayi. About 2 hours before departure, I went to check in and got my boarding pass. Only a convenience store, 7-11 and a cafe at this airport. Checking my flight, it was on schedule. Time to head for the air side. A gift shop but the items inside is quite expensive. Quite a lot of passengers were waiting for their flights. The group of passengers walking to the left, had just arrived from a flight that just landed. My flight was slightly delayed due to the late arrival of the aircraft. The flight departed TSA quite late so I wasn't surprised the flight was delayed but nothing to worry about. What caused the delay? No idea, perhaps technical problem on an earlier flight, who knows. As long as the airline doesn't compromise safety, I won't mind waiting longer for the flight. Once boarding commerced, I made my way to the seat. Unfortunately the flight was full, I guess these passengers also took advantage of the cheap fare. Not long after I took some photos of the cabin, my seat mate arrived. Legroom space of this aircraft is good, so didn't feel cramp at all, I could ride on this for 2-3 hours. Unlike my previous flight with this airline, photography of the cabin was allowed, thanks goodness! Legroom space is around 32 inch. There is no IFE system installed on the ERJ-190. I like this seat, its pretty comfortable . Can you see the airline's crew uniform? Its similar to its parent airline, China Airlines. The cabin crew were at their positions welcoming us on board. I find the service on board one of my previous flight with this airline better. This set in general are reserved but they are friendly and more importantly none of them stopped me from taking photos and the best news for travellers is that Ipads and mobile phones can be used from gate to gate, provided they are in in-flight mode. They won't come to check, but please do check before you store them. The announcement in English from the male crew was barely understandable, I had a hard time figuring out what he was saying and later on the female crew took over and that was much better. The cabin crew emphasis about the mobile phone and tablets to be in in-flight mode and of course the usual safety briefing and demonstration. Pushed back was late and we took around 10 minutes to the runway and departed. No traffic movement at that time, so we could catch up on loss time. The weather was great and it was a smooth flight all the way, no bumps at all. Enjoyed the take off and the landing of the ERJ-190, this is one of my favourite narrow-bodies and to be honest, I rather fly on this aircraft than the more common Airbus A320 and Boeing 737s. As this aircraft type is not available at my home base, Singapore, I would definitely find ways of flying this aircraft type. What I need now is to add the ERJ-175 and -195 to my flight log book. Photo of me happily on board the airline's ERJ-190! I had a choice between orange juice, water or tea. I chose Orange Juice. When the aircraft turns, you get nice view of the city especially with the sunlight behind you. We reached our assigned flight level very quickly. The flight went past too quickly for my liking! It was a great day for flying - enjoying both the ride and scenery. 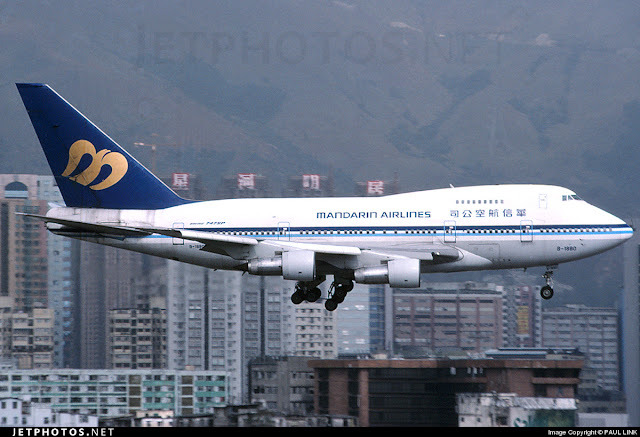 After a few turns, we were soon closing in to Songshan Airport. The airline's logo matches the beautiful blue sky! Getting closer, I won't mind if the aircraft continues to fly! Speed brakes were deployed and the outline of the buildings became bigger while descending. Any of you living in Taipei recognised this part of Taipei? 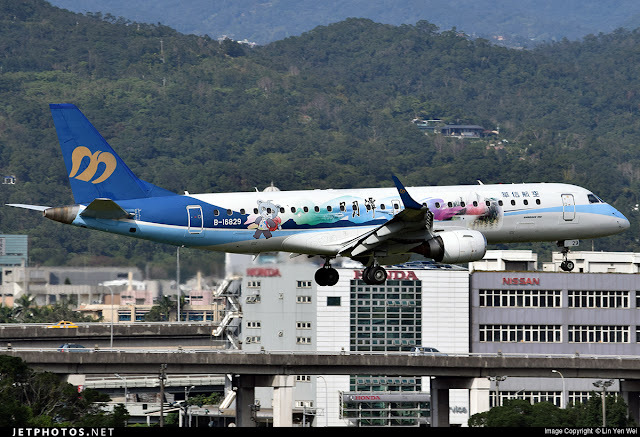 Unfortunately, the sunlight was against my window as the aircraft was on final approach to runway 10 of Taipei Songshan Airport. Most of the passengers were glued to the windows, as our plane approached smoothly to the runway. I hope the drivers were paying attention to their driving! Perhaps I could come to this spot to take photos of the arrival when runway 10 is in used. Speed brake and reserve thrust were deployed and the plane was slowed down to taxiing speed. Announcement by the female crew was made, welcoming us to Taipei and the usual reminder not to leave our seats until the seatbelt sign turns off. This is to prevent any injuries if the aircraft brakes suddenly. Took this photo while I was on my way out. I hope to get this seat when I fly on the ERJ-190 once again. You can check out my previous flight experience with this airline over here. With that, my day trip to Magong has ended. Time passed quickly when you are having fun. Click here for my Uni Air's Taipei Songshan to Magong flight experience. 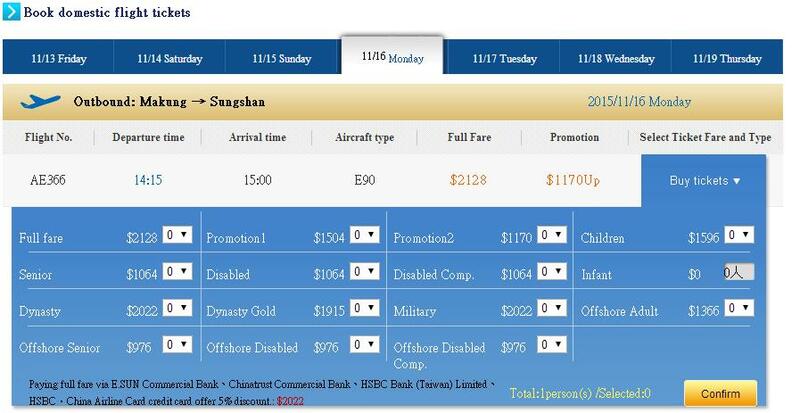 Paying for this flight has to be one of the best deals. Got myself both good weather and the ERJ-190 which is in my opinion an excellent aircraft for passenger's comfort. 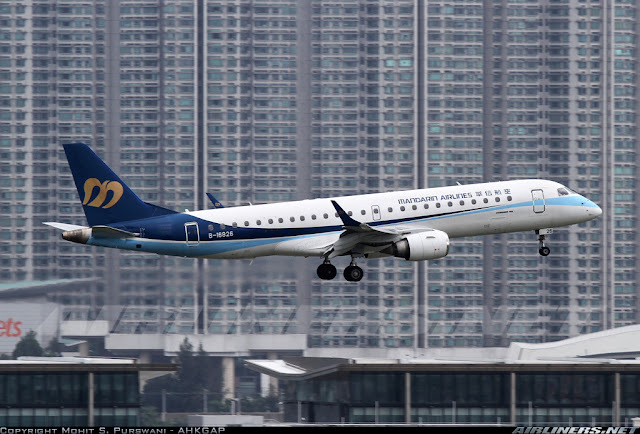 Mandarin Airlines is definitely one of my favourite airlines to fly on and it flies international routes out of Taichung, Kaohsiung and Taipei and the domestic flights, operating Boeing 737-800 and ERJ-190. An advantage this airline has over Uni Air and Far Eastern Air Transport is that along with TransAsia, the airline offers English version of the website to foreigners in particular. 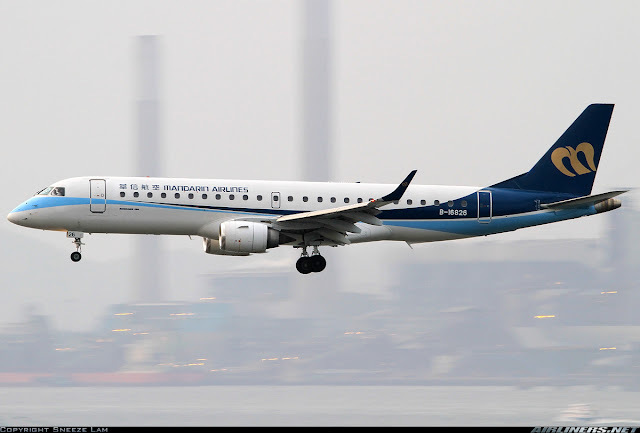 For aviation enthusiasts, you have to fly the airline's ERJ-190 at least once, they will still be around so no rush to coming here and lastly, passengers will be quite satisfied with the cabin service and seat comfort especially the ERJ-190.